March madness indeed. After ‘losing’ an hour to start the week, things were looking kind of looking up with Pi day, then there was the interest rate hike in the US, that whole ‘Ides of March’, the IPO of Canada Goose and finally St. Patrick’s Day on a quadruple witching day. Even though Canadian discount brokerages may be used to these ups and downs, the bigger picture appears to be how to stand out to investors with so much else going on. In this week’s roundup we take a look at a couple of online brokerages attempting to grab the spotlight as best they can amidst a crazy news cycle. The first, a major platform upgrade, could be a signal of some changes to come at a brokerage that doesn’t often make the news. Next we look at what might be the ‘next big thing’ for socially responsible investors and a big differentiator at a bank-owned online brokerage. Also on the menu, we cut through the cat videos, Trump tweets and trolls to find what DIY investors were chirping about on Twitter and on the investing forums. It’s almost cliché at this point but user experience is important for traders on the web today. Over the past four years, there has been a concerted effort by most Canadian discount brokerages to improve ‘user experience’ for their existing and prospective clients. Earlier this year, Scotia iTRADE released a new front end website to improve navigation and usability. 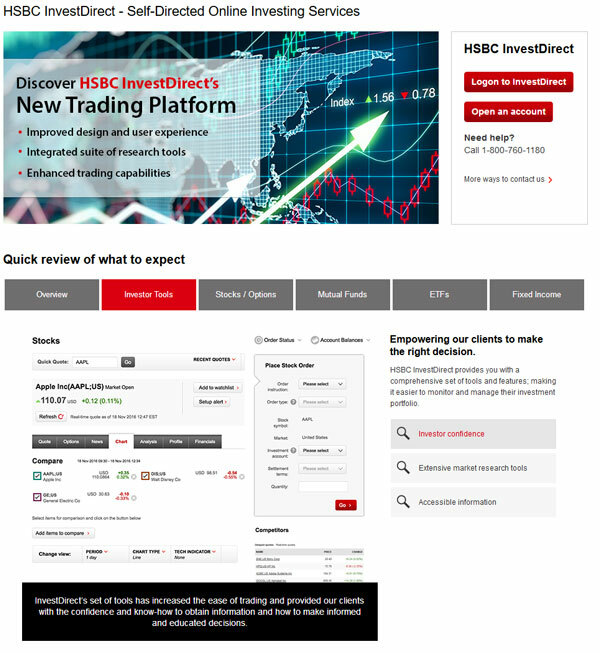 This past week, HSBC InvestDirect posted an update to their website indicating that a major facelift or upgrade to their online trading experience is on its way. Based on an early look at the new platform available on the InvestDirect website, the new trading platform features screenshots that highlight the cleaner look and feel to the landing page. A consolidated view of the holdings, positions and overall gains/losses makes up the dashboard. Asset breakdowns are in line with other brokerage interfaces and contain clear(er) charts showcasing asset allocation, regions/sectors and performance to help track investments. Under their ‘investor tools’ the layout includes essential trading information on a stock as well as essential functionality (such as the ability to trade, refresh for quotes, add stocks to a watchlist or setting an alert). The nice feature they have in their stock window is the ability to compare up to three stocks on a chart against one another. Even though it is clean and somewhat minimal in design, it appears to have some of the more popular features that most DIY investors would require. In terms of screeners, HSBC InvestDirect provided a preview to their mutual fund, ETF and fixed income screeners. The filter parameters include a few standard values such as Risk, MER and Morningstar Ratings as well as the ability to run pre-defined search queries. With so many of these products on the market, a screener that has some advanced filters is a valuable tool. Although this new platform is clearly catered towards the standard DIY investor (more likely the buy/hold or occasional investor/swing trader) it is nonetheless an important step forward for HSBC InvestDirect’s digital identity. Not only will the new platform enable them to better service their existing clients with an improved order entry, research and tracking experience, this newer interface might improve the perception of the HSBC InvestDirect brand. Though the unveiling of a new trading platform won’t necessarily be revolutionary, the fact that it is evolutionary is a good sign for HSBC InvestDirect. And even though it’s hard to tell what else will be changing (if at all) and when, the best news for DIY investors is that they’re not standing still. Another interesting development this week was from Scotia iTRADE who became the first DIY investing brokerage to launch integrated tools to evaluate the ‘sustainability’ (measured across Environmental, Social and Governance – ESG – parameters) of publicly traded companies. The tool itself is developed by a third-party, Sustainalytics, which has been involved in evaluating companies on ESG parameters for the past 25 years. While there will be more to come in an upcoming post, at first blush this new feature looks like a significant directional move by Scotia iTRADE. At a time when marketing budgets across online brokerages are getting increasing scrutiny, the cost of professionally producing and launching a new product video is not insignificant, so the three part explainer videos hint at a major commitment from iTRADE to let investors know about this new feature. Reading between the lines, the coordination of marketing efforts to do this means the ‘sustainable’ angle likely will form an important component to what will differentiate Scotia iTRADE from its peers, especially in the near term. Interestingly, the spotlight on ethical and sustainable issues has never been more timely (and perhaps a tad ironic). The Canadian financial services industry is still reeling from the blowback from the recent CBC news investigation that revealed (alleged) significant ethical violations from front-line staff. How the Canadian banks would fare on an ESG score sheet after this new revelation would be very important to track especially as more details emerge. Feature requests and customer service gripes made up the menu of tweets this week. Mentioned were CIBC Investor’ Edge, Credential Direct, Questrade, Scotia iTRADE, TD Direct Investing and Virtual Brokers. When it comes to investing and trading, everybody starts at the bottom of the mountain. Thankfully there are some good people along the way that can offer sober advice about the journey to becoming a confident DIY investor. In this post from reddit’s Personal Finance Canada thread, one new investor finds out that details matter and keeping them all straight is just the beginning of the juggling act of investing solo. Nothing like a nasty fee surprise to leave a bad impression of a service provider. For one DIY investor trying to deposit a share certificate with Scotia iTRADE, the sting of a deposit fee was enough to have them start to shop around. Read what others had to say about the share certificate fee-asco in this post from RedFlagDeals.com. That’s a wrap on another busy week. For anyone trading this week’s market, hopefully it ended on a green note along with celebratory (or necessary) drink (or two). Next week should be another wild ride for Canadian DIY investors with the federal budget announcement slated for mid-week. Rest up (while you can) & have a great weekend!